Agreement forms, menu templates, and tax forms are some of the documents that restaurant business managers need to have in order to operate their restaurants effectively and legally. However, other than these, restaurant application forms are also useful especially during business application for registering the restaurant to the state and the job application process for the restaurant staff and employees. 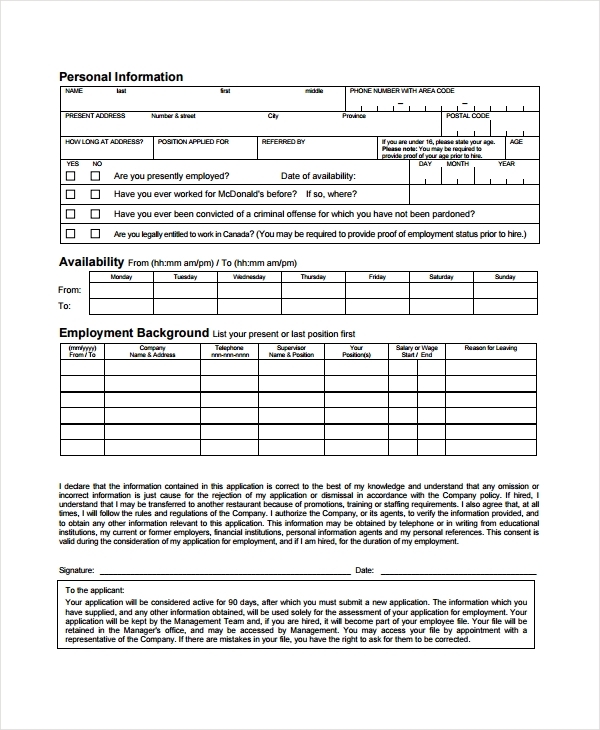 This restaurant employment application template is a printable job application document that any restaurant manager can acquire for their hiring procedures. The form will cater the information of the applicants that are necessary for selecting the final job candidates. However, for higher job positions such as managers and human resource personnel, a manager job application and review form must be used in order to assess and evaluate the skills as well as the capabilities of the applicants in handling the day-to-day tasks of the restaurant business. The job candidate’s personal information, availability, employment background, as well as his declaration of disclosing actual facts are what comprises a restaurant employment application form. The benefits of having this form is that it is not limited to any job description since it can be for general job vacancies due to its basic application template. There are restaurants who offer discounts and perks for their regular customers. 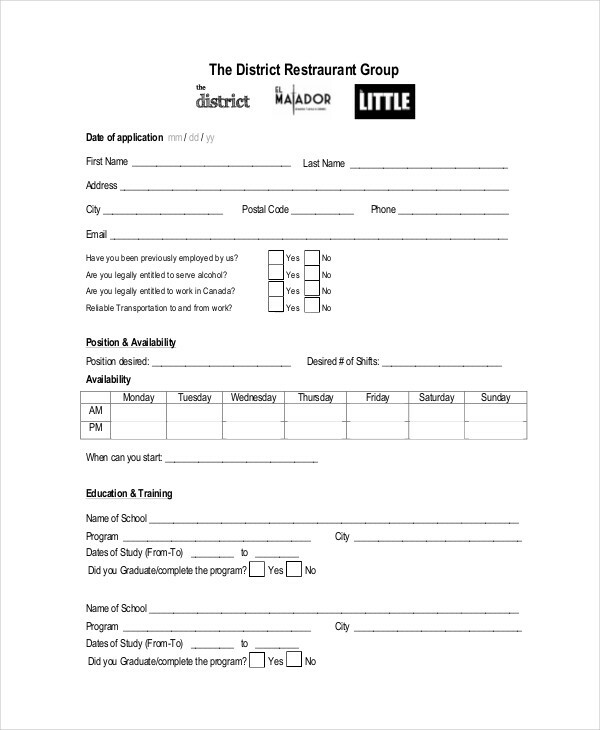 For these restaurants, a restaurant membership application form is essential to gather the details of their returning clients which includes the contact information and favorite orders from the restaurant menu. Having annual membership events will also be beneficial for the restaurant especially in collecting evaluation forms and feedback of how they can improve their business, services, and food options. 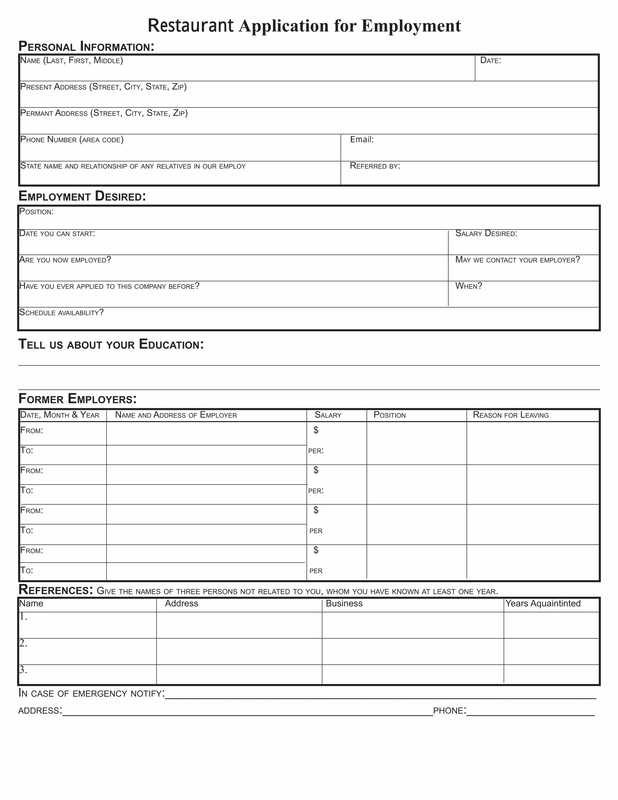 Correcting errors and updating a newly hired employee’s information is the purpose of preparing a supplemental restaurant application form. The updated details are important for the employment records which can sooner be used for filing any sort of document ranging from letters of promotions to employee termination forms. Aside from the employee’s information, the owners and its partnering companies should also update their details especially in contract agreements and ownership forms. This habit of documenting and updating the information will allow legal matters to be settled properly when needed. One of the most important people in a restaurant business is the chef or the cook. With this, the management must use a chef application form for their job applicants aiming to cook for their clients. The form will have the personal details of the chef applicant, his work and character references, his general education, as well as the chef’s skills and specialty recipes. However, when dealing with application forms, the management must review and assess the entries and disclosed information in order to secure that the applicant is not claiming falsified details about his identity or skills. 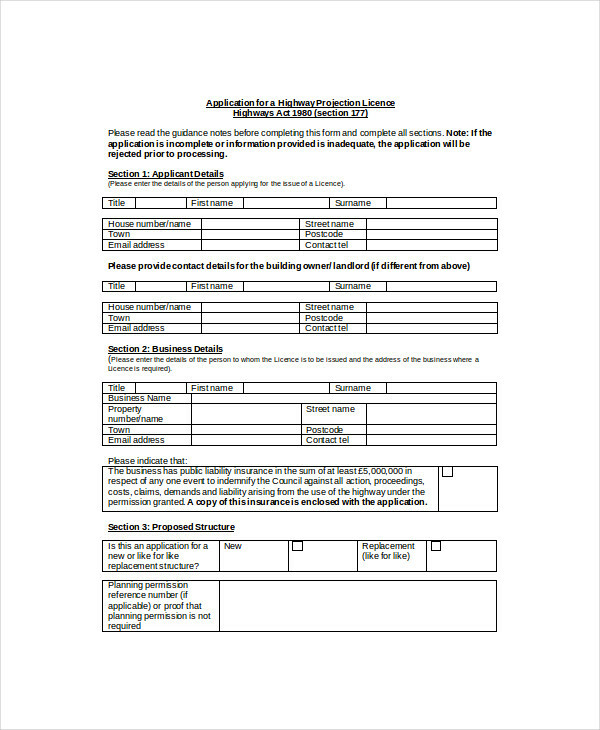 Along with the application forms, the management must also construct other papers such as donation forms, survey forms, catering forms, and restaurant management forms. The donation forms will be useful for the restaurant’s charity works. The survey forms will be for gathering ideas from their applicants, clients, and employees for possible updates in the establishment. 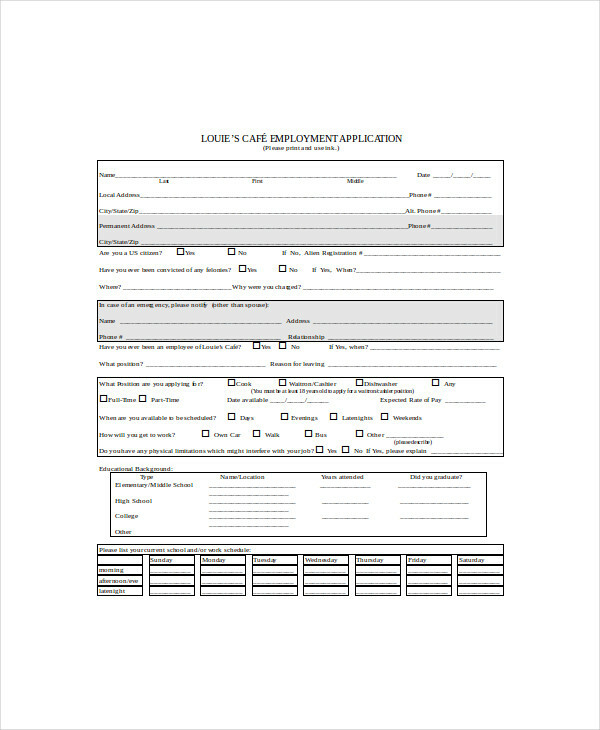 Catering forms are essential for presenting the services and products that the restaurant can offer to their clients. 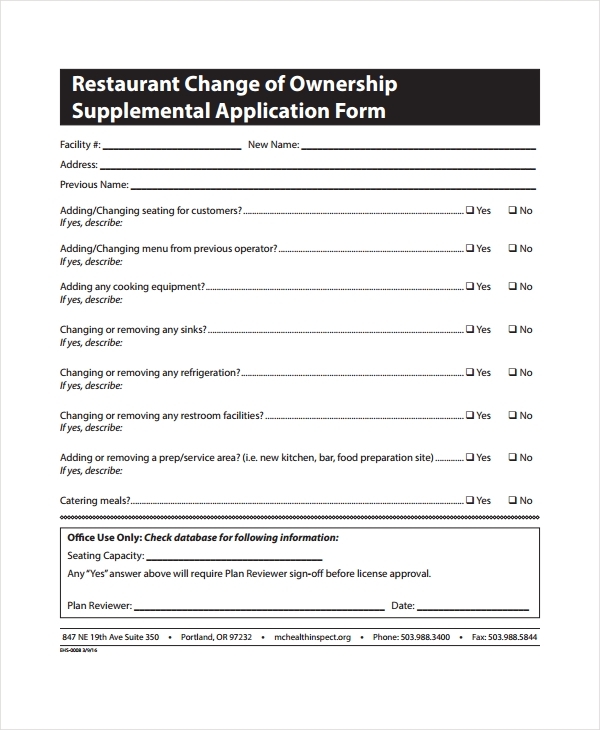 Lastly, management forms are for helping the people in the restaurant in planning ahead and maintaining the path toward the restaurant’s success. After the application period of the job candidates, the management must keep the application forms for record-keeping. With these documents, a staff and restaurant manager appraisals, as well as general manager evaluations, will be effectively conducted. 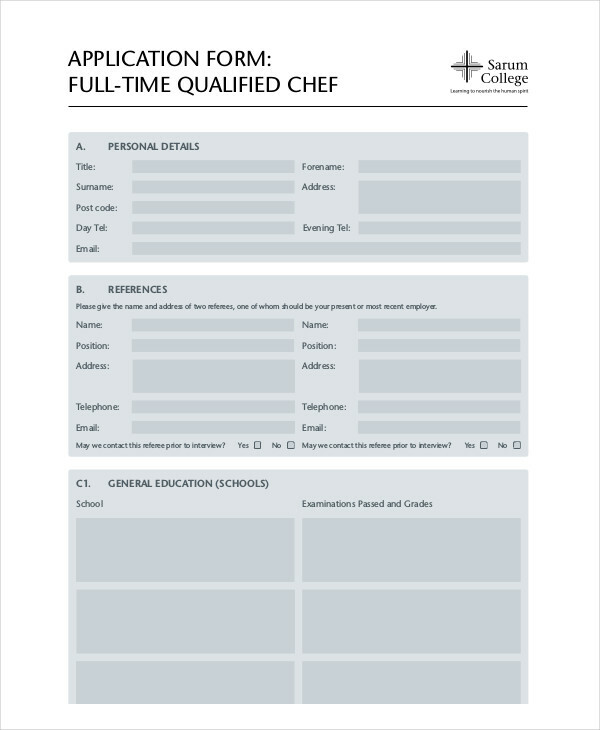 The previously submitted application forms will aid in determining whether the claimed skills and educational attainments were put to use by the hired candidates as they begin their journey being employed in the restaurant business. Cafe restaurants or restaurants with lounge areas need to obtain varying license forms for operating their business. With this, a cafe license application form will be used in order to lay down the details of the cafe as well as its structure. Nonetheless, regardless if a business is a plain restaurant or a cafe bakery, the management should keep track of their inventories and conduct kitchen evaluations from time to time to maintain safety and security in their premises. Although most people already know how to complete various employment application forms, there are always tips to accompany each application especially for different jobs and industry fields. When it comes to applying for a job in a restaurant, the applicant must have specific skills and abilities that the management desires for their employees such as talents in cooking and welcoming clients. 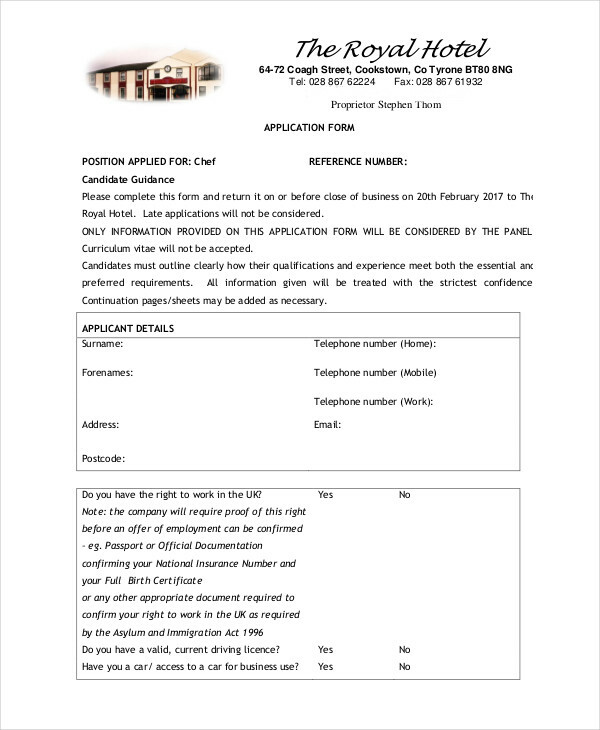 The restaurant employment application form should be filled out completely with the appropriate and updated data along with the available contact details of work references. Leaving blanks to the fields of any application should be avoided; instead, the applicant must indicate an “NA” for not applicable areas, and state answers truthfully. Aside from the applicants, the management should also remember important tips in creating the form such as maintaining balance and assuring that only the necessary data will be collected from the applicants. There should also be separate documents to be filled out by applicants who aim for higher positions such as a chef or a manager in order to aid the hiring committee in conducting a thorough and proper evaluation to each of the applicant’s skills and claims. Other than restaurant employment application forms, waiting lists and event orders are also necessary forms to prepare by the management. The waiting list is used to enlist the names of the customers who are waiting for a vacant table whenever the restaurant is in a full house operation. The event orders, on the other hand, are used for booking and reserving the restaurant for activities such as company meetings and parties. With these documents, a restaurant owner along with its staff and managers will be able to satisfy their clients and partners as well as grab the success of their business at an easy pace.